When Canada-based theatrical troupe Cirque du Soleil brings its latest production, Volta, to the Philadelphia region for a six-week run beginning in mid-July, there will be one South Jersey resident certain to get closer to the action than any other. That would be Wenonah native Nick Pituk—Volta’s head therapist, a masters’ level certified athletic trainer (ATC), who works and travels with the 48-member cast throughout the touring show’s multi-city run. Performed under a big top, Volta, which debuted in the spring of 2017, is one of more than 20 Cirque du Soleil productions taking place around the world at any given time. This newest show is themed around extreme sports: It tells the story of a popular game show host who has been blinded by fortune and fame, but starts a personal quest to find again his true self after a group of free spirits encourage him. Like other Cirque du Soleil productions, it has earned raves as a visual feast of athleticism, acrobatics and dance. For Pituk, making sure each cast member is in the best physical shape possible to perform night after night—along with working with anyone who gets injured— is deeply rewarding. And according to the show’s assistant artistic director, Johnny Kim, Pituk’s work as an athletic trainer is extraordinary to behold. Pituk is especially keyed in to each performance’s training and background— be it in dance, gymnastics or trapeze. “Nick not only uses his knowledge of the human body, he understands the small intricacies of each person’s background and how that impacts their particular work,” Kim says. The only child of Wenonah residents Tom and Audrey Pituk, Nick was a huge sports fan growing up. He also played sports, but not the one sport that later became a big part of his life: football. By the time he graduated from Gateway Regional High School in 1992, Pituk was ready to begin training for a career in sports therapy. NFL Europe as an assistant trainer with the Berlin Thunder. He also had brief academic stints at Drexel University and Georgetown University as an assistant athletic trainer, as well as with the XFL as assistant athletic trainer for the NY/NJ Hitmen. While working on his master’s degree in athletic training at the University of South Carolina, Pituk became a graduate assistant for the college’s football team. In 2005, he was hired as head athletic trainer for the Georgia Force, an Arena Football League team that had just had been purchased by the NFL’s Atlanta Falcons. After two and a half years in that role, Pituk was bumped up to an assistant trainer’s role with the Falcons, while remaining the Georgia Force’s head athletic trainer. “Between working with the two teams, I was very busy and I learned a lot,” he recalls, adding that the Falcons organization was “very good to me.” Pituk was with the Falcons abouta year and a half when a friend from graduate school tipped him off to a job opening in Las Vegas with the production show Le Rêve (“The Dream”) at the Wynn casino resort. The show, set in an aquatic theater-in-the-round, gave Pituk his first taste of working with a different kind of athlete: the stage performer. “It was very different than working with a sports team, but I liked it immediately,” he recalls. 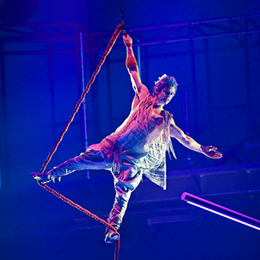 “It was exciting to be part of the creative process and to help the performers on so many levels.” In 2010, Pituk joined Cirque du Soleil; Volta is his third show with the troupe—he also served as head therapist with Mystere and O. That can mean everything from creating and implementing a treatment plan on the road, to setting up physical therapy or even sending an injured performer home to rehab, if need be. “The kinds of things we see are definitely on par to what I was used to working in sports,” Pituk says. “We’re talking 300, 400 shows a year.… With the repetitive nature of any activity, you’re always going to be treating a percentage of people for something. While Pituk says he’d love to ultimately find his way back to the South Jersey region for good—are you listening, Eagles?—he gets to visit often. “Being with a touring show, you get more time off on the road. 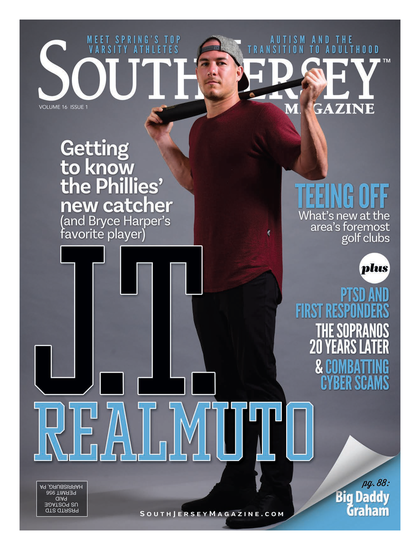 It takes time to set up everything, and that’s when I’m able to get a break and come home for a visit.” While he owns a home in Las Vegas, Pituk doesn’t think he’s ever stayed away from South Jersey for more than six months since launching his professional career. Cirque du Soleil’s Volta will be under the Big Top at the Greater Philadelphia Expo Center in Oaks, Pa. from July 12 through Aug. 5. Visit PhillyExpoCenter.com for more information.